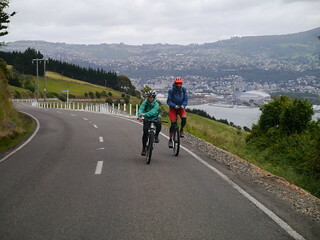 Although this was penultimate day of riding, it would bring us to Dunedin, our final destination. 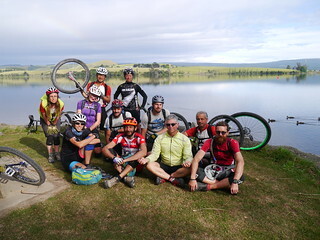 After posing for a group photo along Lake Waihola, we set off towards Dunedin. 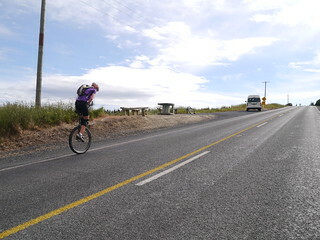 It was mostly on-road riding, but there was to be some STEEEP climbing. 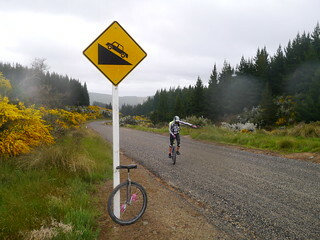 We were back on our climbing cranks as we started grinding up the hill. Eventually we reached the top, and our first glimpse of the coastline. 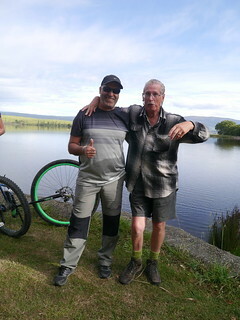 It was gorgeous day as we rode down to Taieri Mouth, a small fishing village at the outlet of the Taieri river. From there we followed the coastline, for another obligatory ice-cream stop in Brighton beach. 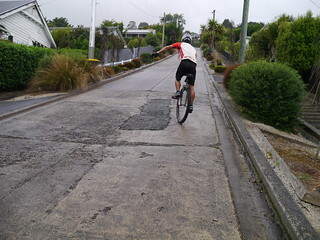 As we reached Dunedin we were hit with another steep climb, and another steep drop- they build roads straight over hills around here, instead of around them! 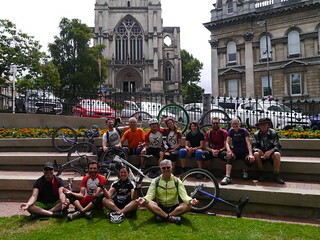 The final run in to Dunedin took us through to the Octagon, the town centre. 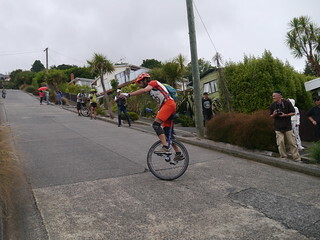 We posed for photos outside the town hall then checked in to our accommodation before heading to Baldwin Street, the worlds steepest residential street, to test the legs further. 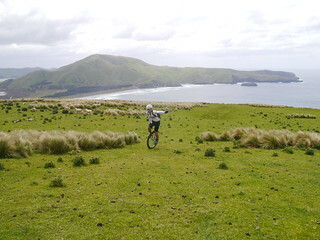 Ken was the first to ride up, on his 29”/125 unicycle, but with his seat twisting had to try again. Tomas was the next to have a go, followed by Nicola and Natascia and Sean. 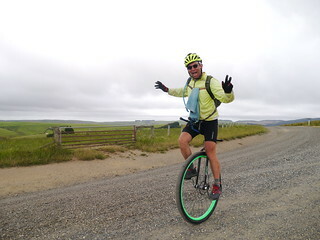 Dave brought along some 20” unicycles so we could all attempt on a lower gear. Ken and Tomas both made it up eventually, although conditions weren’t ideal as it had started raining. 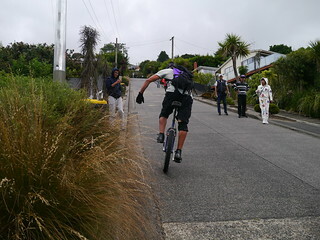 Most of the riders slipped and skidded as they hit the steep part of the climb. When we’d had enough climbing for the day, we went back to the hostel for pasta Italian style, with Gaetano relieving Anna as head chef. There would be a lot of climbing on todays ride, so most of us had our climbing cranks ready! We rode 2km out of town before hitting the climb, which rose up like a wall to greet us. We met the support vehicles at the ‘top’, and after grouping we were relieved to hear Dave Goodman tell us tht it would be ‘rolling’ hills from there. The rolling ‘hills’ turned out to be more like rolling mountains, as it continued up and down in a rather steep, long manner. 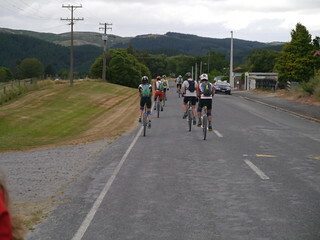 The gravel road had just been re-‘gravelled’, which made it very difficult to ride as our wheels sank in. Dave’s son Daniel met us near the top and rode with us for a while. 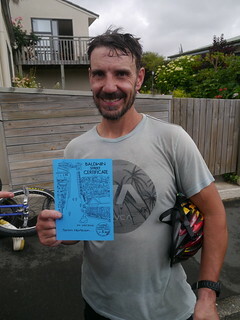 Dan was on the first SINZ tour, so it was nice to have him ride with us again. The descent was steep, dropping from pine forest into native bush with plenty of wood pigeons flying overhead. We stopped for lunch then hiked to Waipouri falls, a secluded waterfall and swimming hole. 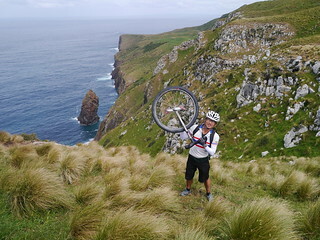 After this we continued our descent and were met by Dave’s wife Novelia who had a picnic waiting for us. The final stretch to Waihola was mainly flat and via a backroad, but various routes were taken including a busy stretch along State Highway 1. 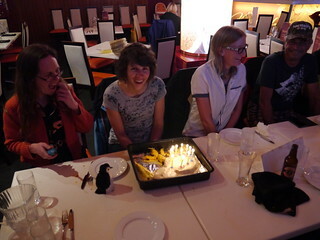 Luckily we all made it to our hotel eventually!